Cozumel is Mexico's most famous tropical island resort and is located off the coast of the Playa del Carmen on the Yucatan Peninsula. Every year hundreds of cruise ships ferry travelers, honeymooners, and adventure seekers alike from all over the world to this beautiful Caribbean island. 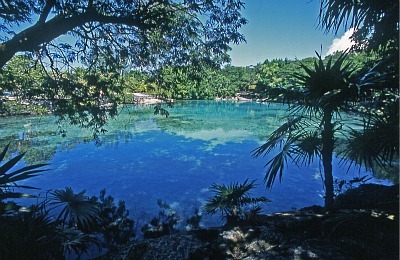 Ancient Mayan ruins and natural reefs compliment Cozumel's immaculate coastline. You don't even need to travel far from the port to walk along the island's near-perfect beaches or explore its lush tropical landscape. Three piers serve cruise ships passing through Cozumel. The primary docking terminal lies at Punta Langosta, located on the shores of the island's only city, San Miguel de Cozumel. But the International Pier and Puerta Maya to the south of Punta Langosta also see plenty of cruise ship traffic throughout the year. 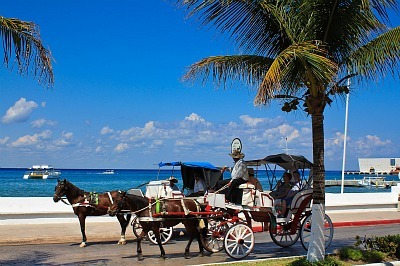 No matter where you arrive and disembark for the day, Cozumel's prime attractions are very accessible on foot, or by taxi, which is the most useful way to get around the city. If you happen to be in the mood for an adventure, look no further than the San Gervasio Mayan ruins only a few miles east of San Miguel. In fact, Cozumel is home to many ancient Mayan landmarks that are over 2,000 years old. But the San Gervasio ruins take the prize as the largest ancient structures left standing on the island. The Plaza del Sol is another attraction you have to see while docked in Cozumel. This retail complex provides cruise ship travelers with plenty of opportunities to find the perfect souvenir. 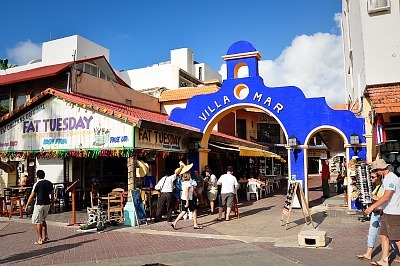 Locally known as 'zocalo', Plaza del Sol houses shops, which sell jewelry, clothing, handcrafted products as well as other memorabilia. One of the most popular activities on the island is the Palancar Reef. From San Miguel follow the shoreline south on the Rafael E. Melgar Boulevard in order to find Cozumel's world-renowned snorkeling and diving waters. Water sports like sailing and surfing have a strong following as well on the island's long, pristine beaches. You can take part in all kinds of outdoor activities while on Cozumel. For example, Chankanaab National Park services over a million visitors each year. Both snorkeling and diving, especially into the infamous underwater Chankanaab Caves, are very popular activities in Cozumel. While there are a number of restaurants within walking distance of the cruise ship terminal, a short taxi cab ride into the heart of San Miguel can give you a better feel for the wide range of dining options. Mexican and Caribbean cuisines are the most common ones. Cozumel's fresh seafood is very popular and is a major attraction in town and out on the beach. Once you set foot on Cozumel, many of the island's best amenities are located within walking distance from the dock. But a large number of visitors opt to get around the island by taxi. If you happen to be the adventurous type, you can rent a vehicle for the day. But it is advised that first time visitors stay close to San Miguel since many of the island's inland rural roads are isolated and may be in poor condition. While the official currency is peso, most shops accept (even prefer) US dollars. Also, almost all shops have English speakers in case you don't know Spanish. There is also a calling station (located at Plaza Orbi - Local 1, Av. Rafael E. Melgar 27) that you can use for Internet or for making an international phone call. 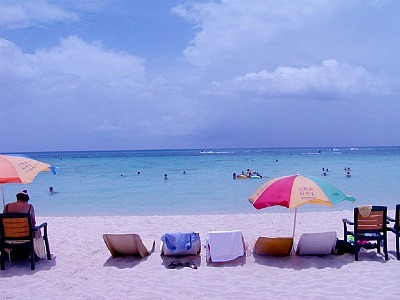 Cruise travelers having a great time on beautiful beaches of Cozumel. There are many places where you can buy souvenirs, do some shopping and/or enjoy a great meal. Relaxing afternoon in Chankanaab National Park in Cozumel. A couple is enjoying the beautiful day in Cozumel.